For the first time in nearly six decades a Castro si not in charge in Havana. The new president Miguel Diaz-Canel, who took over from Raul Castro on Thurday, inherits a country facing a number of challenges. "Now starts a fundamental legislature. Fundamental. Not only because it is new, but because it has in on its hands a country in very difficult economic conditions and very difficult social conditions. It has a program of reform but it is very complicated," explained Aurelio Alonso, a cuban intellectual who as a 29 year old supported the 1959 revolution as it was unfolding. 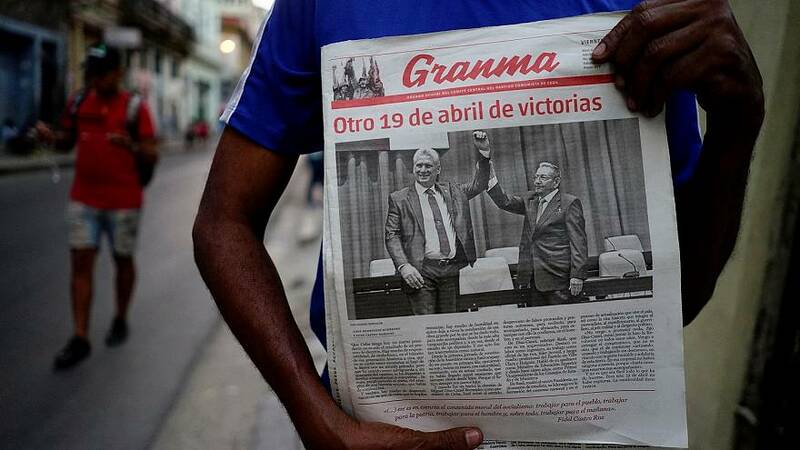 Diaz-Canel, a stalwart of the communist party, has promised ideological continuity though some sections of Cuban society, are asking for change. One of the most contentious issues for young cubans is the slow progress of freedom of information. Though newly installed "wifi zones" in public spaces have given cubans access to the internet, the new president doesn't seem to welcome these advances. "Some months ago a video was circulated in which Diaz Canel considered that the new alternative media in Cuba is a subversive tool created outside Cuba," says Jose Jasan the founder of the online multimedia platform El Toque. "That is a very prejudicial opinion, not based on facts and it is despicable because it shows that it has not been understood that inside Cuban society there is a demand for changes and information that has been channeled in the way we do our content,: he added. Euronews correspondant Hector Estepa says that Cubans do not expect big changes during the first months of presidency of Miguel Díaz Canel and that he will most likely take the lead from Raul Castro who remains at the head of the all-powerful Communist Party.